After Memorial Day's explosive (literal and otherwise) box office, the new releases from the last week of May look to continue on that record setting pace. Ha! Just kidding. No, these are total after thoughts, and you'll likely to lucky to remember them past September, despite their high profile casts. 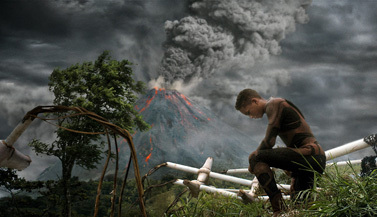 After Earth may have Will Smith front and center, but the performance of this film is more interesting for how it will affect the future potential of M. Night Shyamalan, who has spent the last dozen years or so frittering away all the good will he ever had with audiences by producing film after film of ludicrously plotted, poorly acted and overly didactic nonsense. This perhaps culminated with the instant classic The Happening, a film that even Ed Wood might have disowned. His follow-up, The Last Airbender, was marginally better in that it didn't become an instant punchline, but it was perhaps more incompetent in its own way, destroying a franchise in its cradle. In short, Shyamalan destroys everything he touches lately, and audiences are wise to it. Becoming infamous for one of the most precipitous drops in cinematic history can't be good for much of anything. And yet someone's entrusted him with a great big budget and a real star again, albeit for a film that's ultimately kind of gimmicky. Will Smith stars with his son Jaden as explorers on an Earth 1,000 years in the future (at the exact moment the Kid 'N Play hairstyle came back), but filled with incredibly hostile creatures designed to attack humans (they must have been very lonely). While the elder Smith is the bait for the posters and ads, it's the younger Smith that's tasked with carrying the majority of the film, to which you're now remembering The Karate Kid remake, as well as Shyamalan's record of working with child actors except-for-that-one-time-oh-how-that's-such-an-enormous-fluke-in-retrospect.